By Scott Klinger and Sarah Anderson — Republican and Democratic leaders don’t often see eye to eye on taxes. But surprisingly, corporate tax reform looks like one area where there might actually be some potential for bipartisan action in Washington. This should be good news, since our corporate tax system is clearly hopelessly broken. Here’s a stark indicator of just how broken: Last year, 29 of the 100 highest-paid CEOs made more in personal compensation than their companies paid in federal income taxes. That’s according to a new report by the Institute for Policy Studies and the Center for Effective Government. Yes, it’s gotten that easy for large corporations to avoid the Tax Man. This is true even for the country’s wealthiest companies. 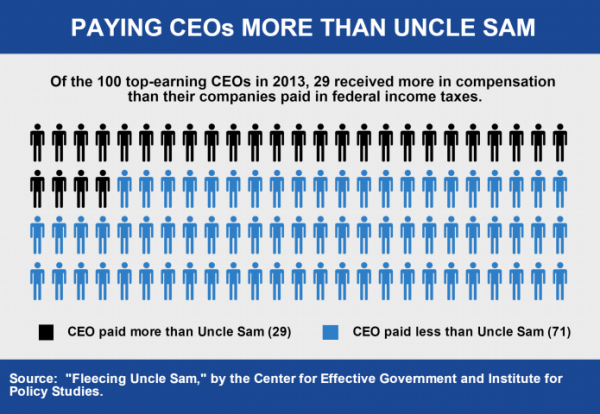 Citigroup, Halliburton, Boeing, Ford, Chesapeake Energy, Chevron, Verizon, and General Motors all made more than $1 billion in U.S. profits last year, but still paid their CEOs more than they paid Uncle Sam. In fact, most of them got massive tax refunds. While big businesses moan about the U.S. corporate tax rate of 35%, most of them pay nowhere near that. Between 2008 and 2012, the average large corporation paid an effective rate of less than 20%. Hiding profits in tax havens is one of the most common ways large corporations avoid paying their fair share to the IRS. And indeed, the 31 firms who paid their CEOs more than Uncle Sam operate 237 subsidiaries in low- or no-tax zones like the Cayman Islands and Bermuda. But that’s just one tax-dodging trick. Corporations have lobbied successfully for a plethora of other tax loopholes and subsidies. Boeing, for example, has figured out how to double dip in the Treasury’s pool. The aerospace giant hauled in more than $20 billion in federal contracts in 2013. According to Citizens for Tax Justice, taxpayers also picked up the tab for $300 million of Boeing’s research expenses last year through a tax break that Congress is now considering making permanent. When tax time came, Boeing got $82 million back from the IRS, despite reporting nearly $6 billion in U.S. pre-tax profits. Meanwhile, Boeing chief executive Jim McNerney made $23.3 million. Corporate tax dodging is bad for ordinary Americans — and our nation’s long-term economic health. For example, if Boeing had paid the statutory corporate tax rate of 35% on its $6 billion in profits, it would’ve added an extra $2 billion to the funds available for public services. That sum could’ve covered the cost of hiring 2,775 teachers for a year. Shirking taxes may boost the bottom line in the short term, but in the long run it erodes the economic infrastructure businesses need to be competitive. Unfortunately, the current political rhetoric has little to do with cracking down on corporate tax avoidance. Republicans are hooked on corporate tax giveaways. And President Barack Obama has suggested that he’s ready to reward corporations for stashing money overseas by giving them deeply discounted tax rates on their profits if they’ll just agree to bring them home. Both of these positions are based on the unfounded claim that smaller corporate tax burdens translate into more good jobs. In a Hart Research poll of voters on election night, only 22% favored taxing corporations less. In the same poll, less than 30% wanted Congress to make tax cuts a higher priority than investments in education, health care, and job creation. The American people have their priorities straight. They deserve leaders who do too.